Can this be fixed or repaired? I downloaded the instructions manual for the Motorola S9 HD and implemented them. It worked fine! Getting a suitable replacement battery is the easiest part. The official battery is an SP0530AD, but a cheap 051235 battery off Aliexpress for $5 or so works fine as a replacement; a 611235 should fit too if you want a little extra capacity. The hard part is actually getting at the battery to replace it. It's located inside the big lump at the back of the headband, together with the electronics. Carefully peel away the rubber covering the inside back of the headband and the power button to reveal an access cover beneath a layer of clear tape and goop. Don't try and peel past the outside edges of the two shiny black bands - it won't come off and you will cause damage if you force it. 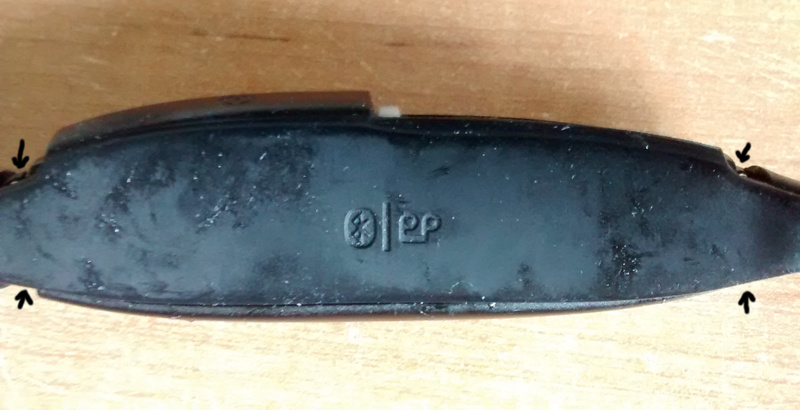 Having done that, you should be able to see that the two shiny black plastic bands are actually clips. Prise them off to reveal 4 tiny screws that hold the battery cover in place, one in each corner - they're kind of hidden by the goop and tape so you'll probably have to push it back a little to see and unscrew them. Now you can very carefully peel up the clear tape covering the power button and prise the cover off along the top and bottom seams to reveal the battery. Be very cautious when doing this - the cover and headband are really fragile once separated and it's easy to damage them like I did. It doesn't help that there's rubber in your way whilst doing this. The flap over the charging socket will fall off, make sure to put it somewhere safe. Once you're inside, you can peel the old battery off the PCB and either unplug it or just cut the wires and solder the new battery's leads onto them - make sure to protect the joints from shorting with heatshrink if you do that though. Finally, you can stick the new battery in place and carefully put everything back together. Don't forget to put the flap covering the charging socket back when slotting the battery cover back in place, and double-check it's still there before you screw the cover on, or you'll have to repeat the most fiddly part of the whole procedure! (I made this mistake more than once.) Finally, you can stick the rubber back in place. 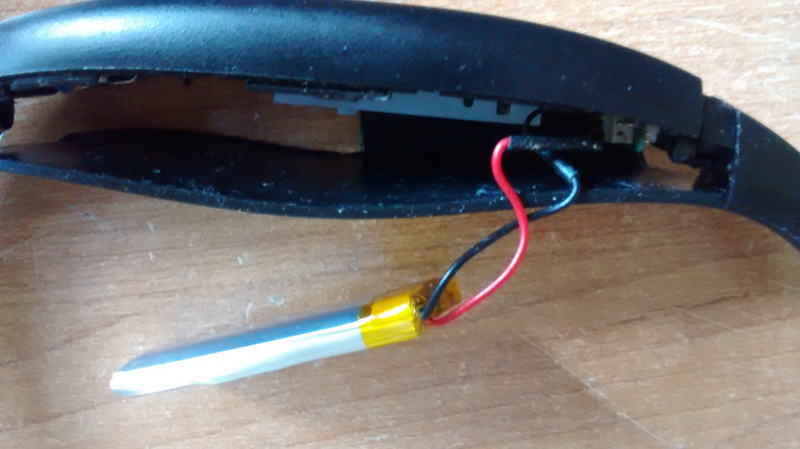 If you're lucky you should now have a working Bluetooth headset with a fresh new battery - and hopefully it won't have to be patched back together with glue and prayers like mine now is. How do i replace motorola s9 battery? The battery cannot be changed. The light should be visible if you are on active hold. Just try and see if the device works as is. If so you answered your own problem. If not, contact the manufacturer for a fix. Motorola Headset S9 Control Keys Prob. i am using motorola S9 for last one year. I had the same problem of controls keys which i have corrected of my own. Most of the sites i read say's this problem is due to the moisture. Let me tell its not because of moisture. Below steps will help you guys hopefully if its only the keys control problem. which is different from the other part. horizontal 2-3 thin lines at the edges and dot at the centre. been covered with the rubber kind of gum used to stick thes layers. with the same type of glue. there u are ur problem is solved enjoy the best music experirnce with your S9. if u want a video for this i wll b up loading it soon and post d link. This is caused by a power surge. To correct, plug your headset into charge, and then plug into power strip. Trip the switch on the power strip to off. It will cause a drain and turn off your green light and then allow the headset to turn back on. 1. plug the charger into the wall. 2. plug the headset into the charger. 3. unplug the headset from the wall. Plugging & unplugging the headset to charger multiple times had NO effect. It was only when I plugged it into the charger and unplugged the charger from the wall that the green light turned off and the headset began to work normally. S9 use the popular USB connection which sometimes produces errors while connecting. These messages are similar to the "Device Not Recognized" error received with various USB devices. Fixing an S9 is sometimes specific to the brand, but they are so similar that most can be fixed the same troubleshooting steps. Click "Start" and go to "Control Panel." Double-click "System" and locate the Hardware tab to find the Device Manager. Vista and Windows 7 users can just type "Device Manager' from the start menu. Locate "Disk Drives" from the list and double-click "Portable Device." If there is an exclamation mark or other error on the device, go to the "Drivers" tab. Click "Uninstall" and remove the player. Restart the computer and attach the player reinstall the drivers. Plug the S9 into a different computer to see if it gets recognized. If it does not, contact the manufacturer to find out if it is broken. Turn off your anti-virus program on your PC if the device works on other computers. Reinstall the drivers using the device manager as described in section 1. Plug in the S9 to confirm the connection. Check the battery level and make sure the batter is not low or depleted. A low battery will sometimes prevent the S9 from connecting. Let it charge from the power cord, if necessary. Verify that you have at least Service Pack 1 installed. Go to the Start menu and type "Run." Press Enter. Type "Winver" in the box and press "Enter." The Windows version will be displayed along with any installed service packs. Download a service pack from Microsoft, if applicable. Remove the player from the USB port and push a pin into the reset hole located on the bottom. Reconnect to see if the problem is resolved. Check the connection to make sure it's secure. The cable should fit firmly into both the S9 and the computer. Connect to a different USB port if you have one available. Download updated firmware or use the S9 Recovery Tool provided under Resources. A bad cable will sometimes prevent a good connection. Use a different one to isolate the cause. Press and hold the power key (under the red cover) longer than the time required to turn it on, until its indicator light is alternately flashing in red and blue. It is in pairing mode (discoverable) now. Then, make your phone (or computer)'s bluetooth application search for new devices. After a little while, the S9 should appear on-screen. Select it and make it connect. If a pairing code (or PIN, or passkey) is requested, enter '0000' (four zeros). If the pairing process is successful, the S9 should enter the stand-by mode. There could be such an indicaton in your phone (or computer) too. Make sure you put the headset into discoverable or pairing mode, there should be specific instructions that came with your head set to do this, then use the droid or the backflip to scan for the devices and it should find them. Have a manual for Motorola Mobility MOTOROKR S9 Wireless Headset for Bluetooth-Enabled Cell Phones - Black/Red?